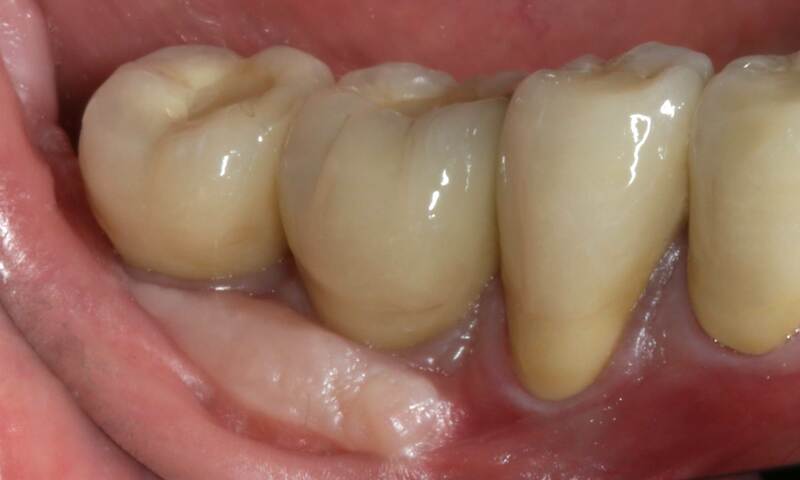 A 54-year-old man presented with missing right lower teeth and ridge deficiency. Clinical examination revealed that the mandible was edentulous from the right lower first molar to the second molar region. Radiographically, atrophy of the mandibular alveolar ridge in the same teeth site was observed. Bone quantity of 2-3 mm thickness at the crest, 8 mm and 6 mm residual bone on top of the nervus alveolaris inferior in region #46 FDI / #30 US and #47 FDI / #31 US. 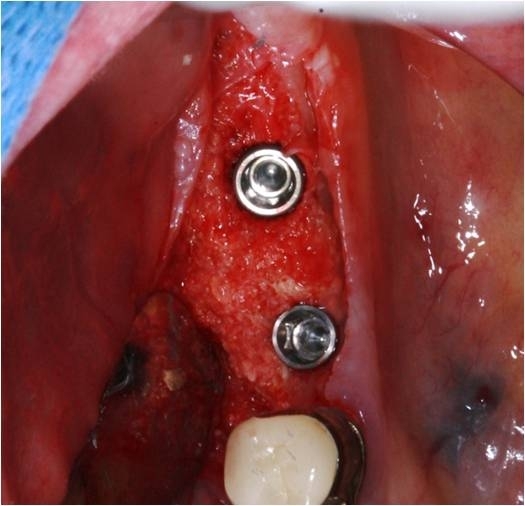 Horizontal and vertical augmentation by GBR (guided bone regeneration) was carried out using the “tenting screw technique”. This technique involves expanding the soft tissue volume and using screws as “screw tent poles” for the surrounding particulate graft. This helps prevent the soft tissues from contracting around the particulate graft and subsequently displacing it or causing physiologic resorption. 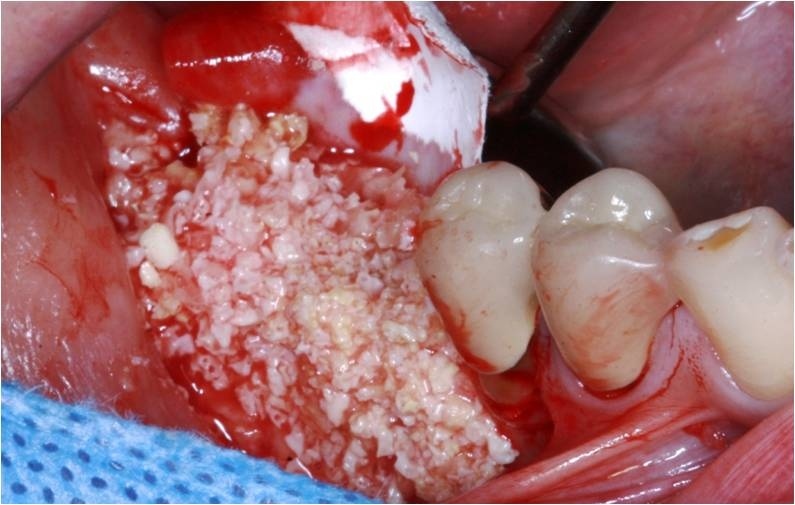 To immobilize the bone graft a creos™ xenoprotect was used, which is a resorbable, non-chemically cross-linked membrane. After 6 months bone augmentation on the alveolar ridge was noticeable and two NobelActive® implants were placed. 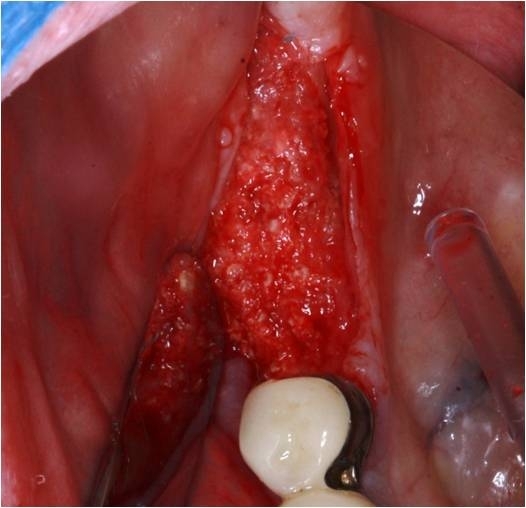 After 4 months of healing, a free gingival graft from the palate was used as there was no fixed mucosa on the buccal site. 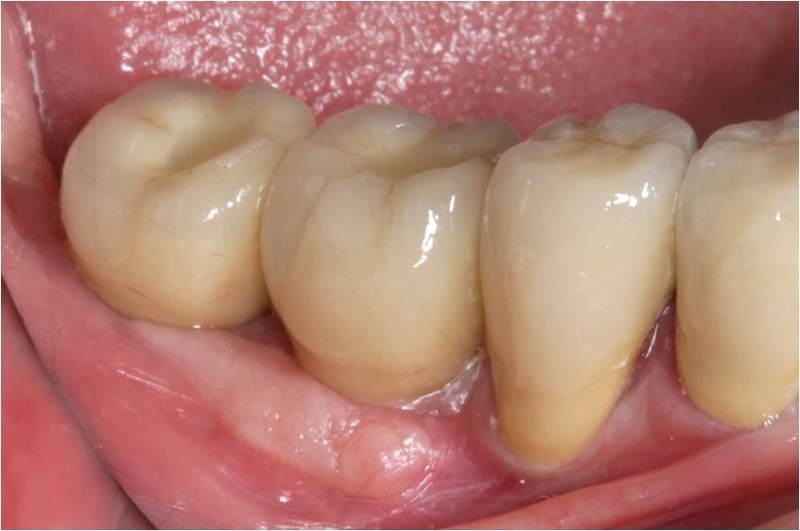 Once the soft tissues were appropriate, two full-ceramic crowns were fitted. 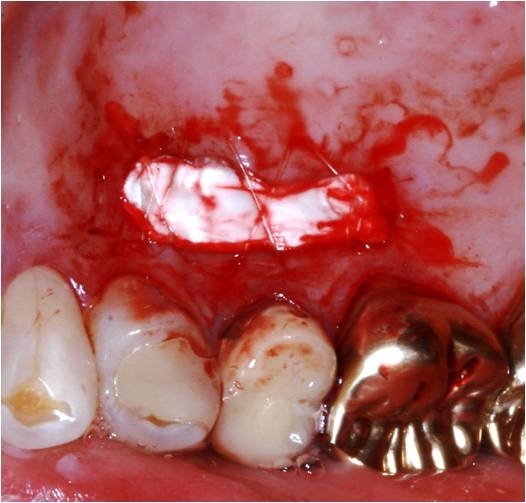 Alveolar ridge in region #46 FDI / #30 US and #47 FDI / #31 US with horizontal and vertical defect. Panoramic radiograph before the GBR procedure. 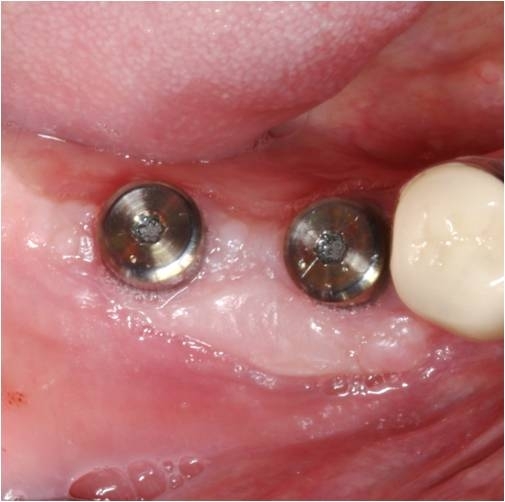 The radio-opaque objects on top of the ridge on the lower right quadrant are metallic guide sleeves to determine the implant position. Bone condition after flap elevation with cortical perforations. Cortical perforation of the receptor bone may improve angiogenesis in bone grafts and increase the amount of newly formed bone in grafted areas, especially in the early bone healing phase. To perform the “tenting screw technique”, two 10 mm long osteosynthesis screws were fixed on top of the ridge extending 6 mm above the bone. This technique involves expanding the soft tissue volume and using screws as “screw tent poles” for the surrounding particulate graft. This helps prevent the soft tissues from contracting around the particulate graft and subsequently displacing it or causing physiologic resorption. 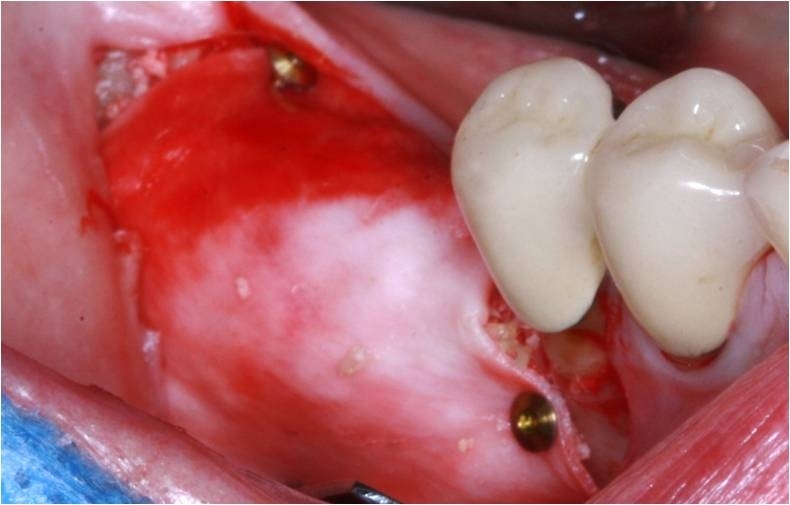 Creos xenoprotect membrane was fixed lingually using two titanium pins. This membrane is resorbable and non-chemically cross-linked. Composite bone graft of about 50% autologous bone chips and 50% DBBM. 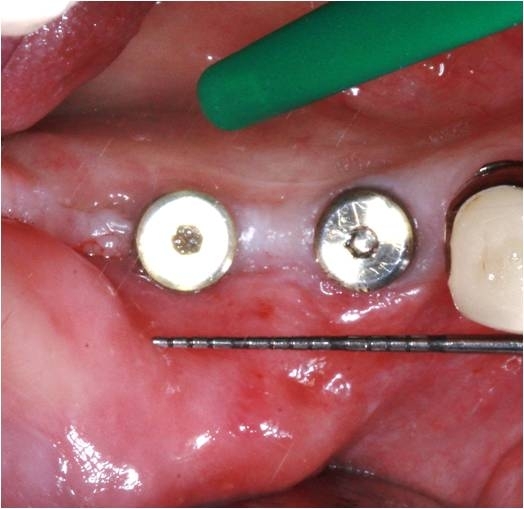 Bone graft successfully immobilized through fixation of the creos xenoprotect membrane using three additional buccally fixed titanium pins. 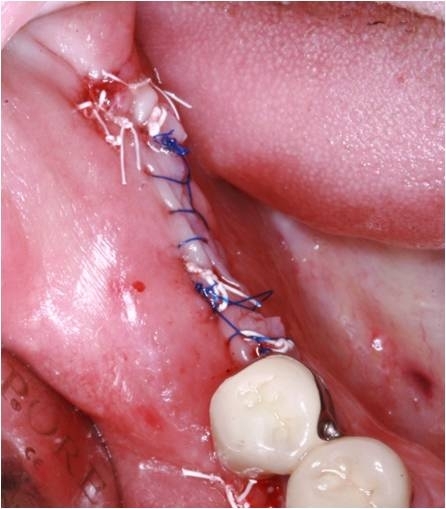 Continuous sutures combined with horizontal mattress sutures for uneventful healing. Panoramic x-ray after the GBR procedure. Alveolar ridge after 6 months of healing. Bone gain amounted to 3 mm vertically and 8 mm horizontally. 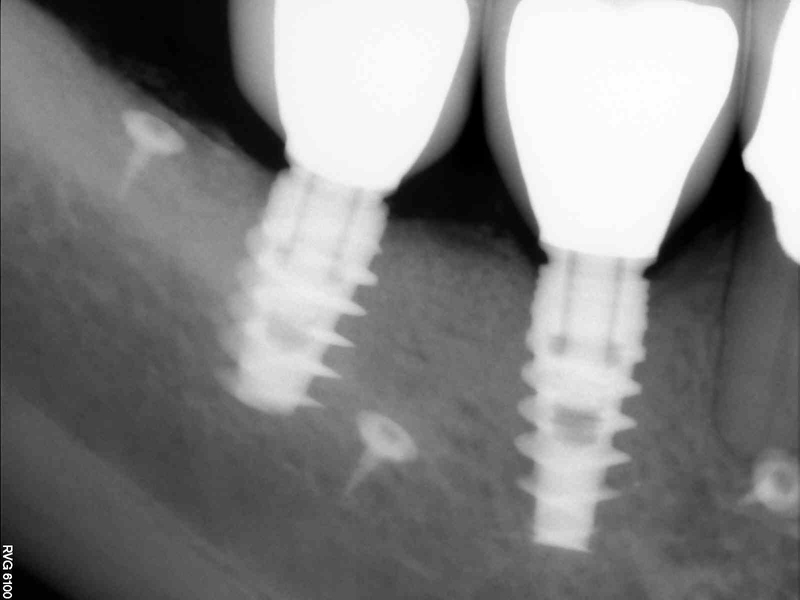 Two NobelActive® implants were placed in region 46 (4.3 mm x 11.5 mm) and 47 (5 mm x 10 mm). 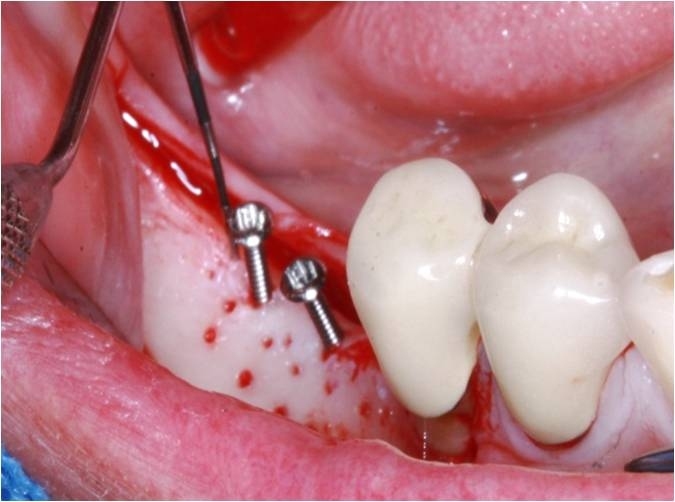 One-stage procedure using two healing abutments 5 mm x 5 mm placed for transgingival healing. 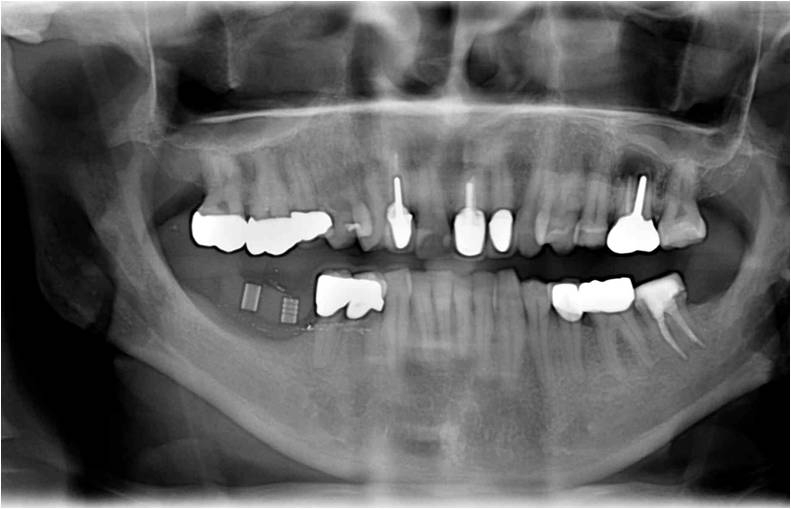 Panoramic radiograph after implant placement. Situation after a four-month healing time. The absence of attached gingiva buccally necessitates a free gingival graft. 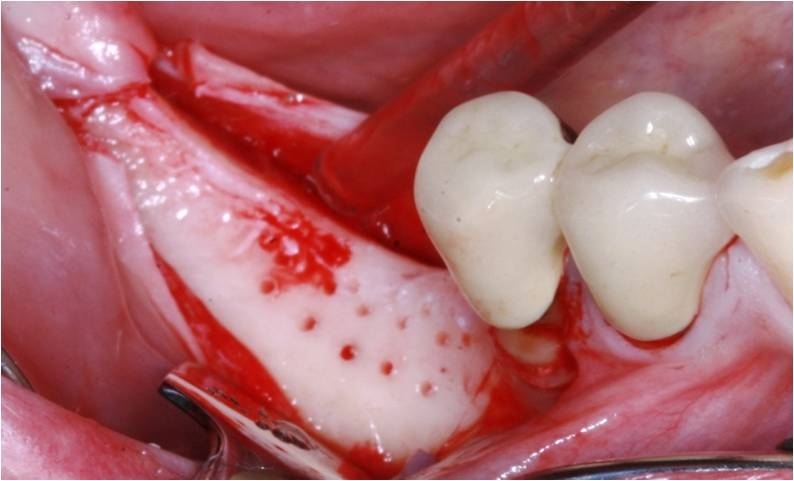 A free palatal gingival graft of 15 mm x 5 mm was harvested. The donor site was covered with a collagen matrix dressing. 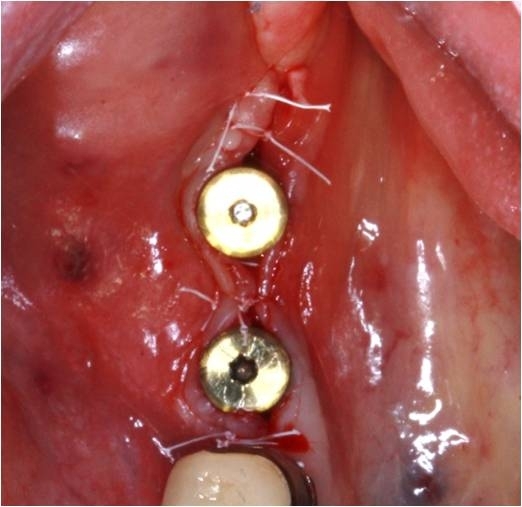 An apically repositioned flap was elevated and sutured periosteally. The graft was fixed by means of cross sutures. Soft tissue healing after 8 weeks. 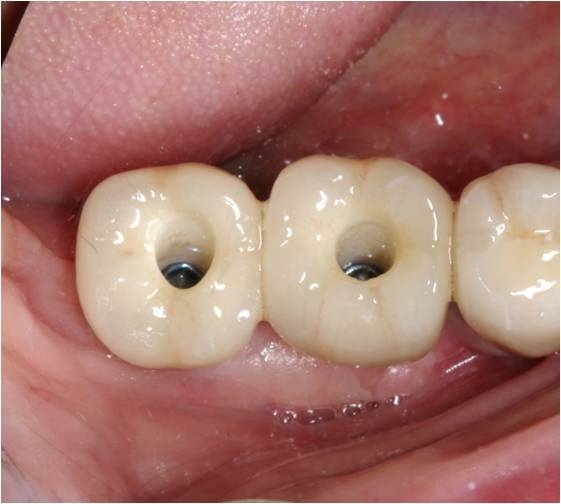 NobelProcera restorations with two zirconia angulated screw channel abutments. 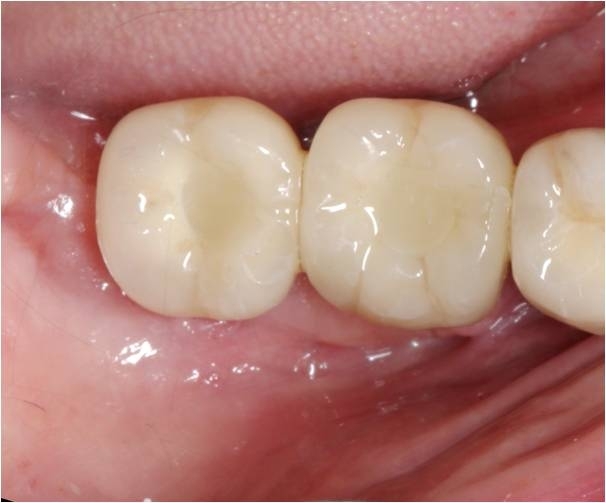 Occlusal view of the full-ceramic crowns #46 FDI/#30 US and #47 FDI/#31 US. 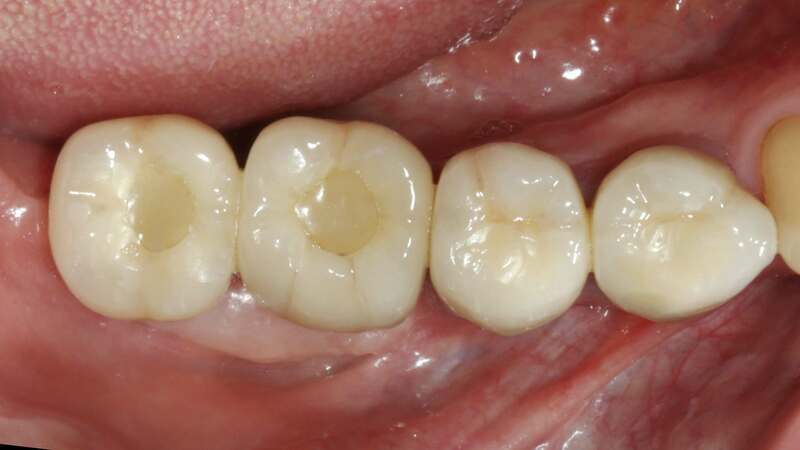 Buccal view of the final full-ceramic crowns. One-year recall appointment. The bone level as seen on the x-ray seemed to be sufficient. Intra-oral occlusal photograph after one year post-treatment. 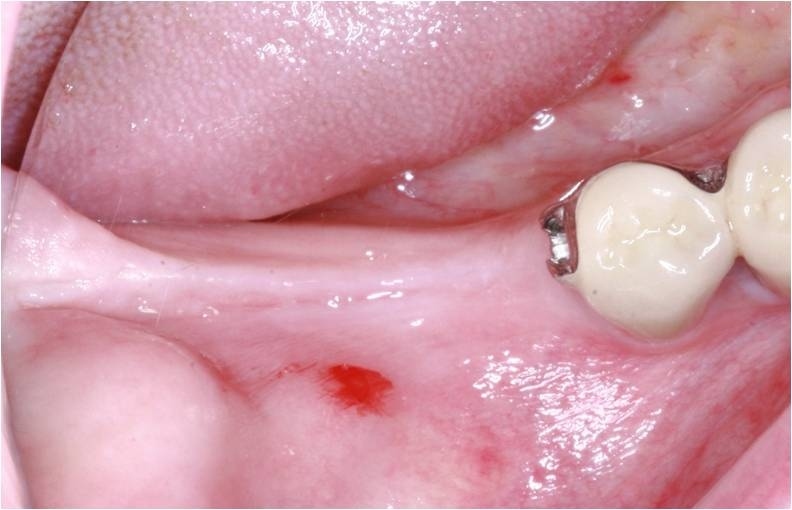 Intra-oral buccal photograph after one year post-treatment. 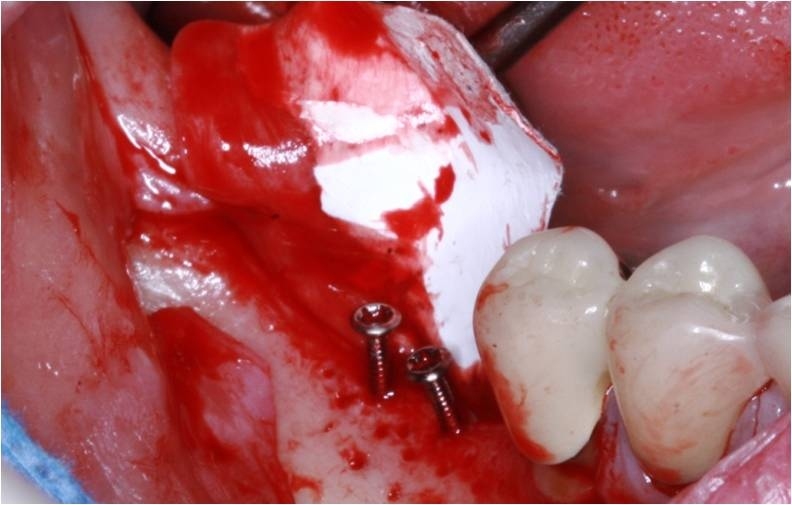 The soft tissues arround the implant crowns were in great condition. 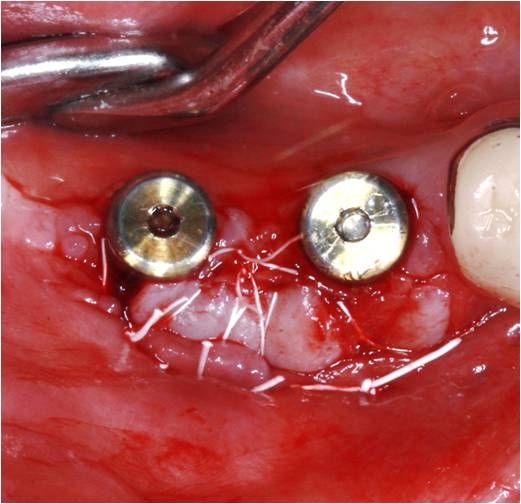 Nishimura I, Shimizu Y, Ooya K. Effects of cortical bone perforation on experimental guided bone regeneration.Clin Oral Implants Res. 2004 Jun;15(3):293-300.